The Fermoy Community Youth Centre is a registered charity and is completely self-financed. 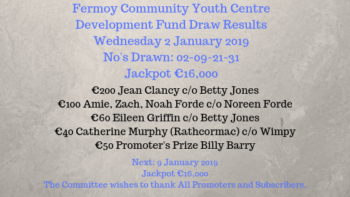 We are very grateful for the continued support of the local community without whom the Fermoy Community Youth Centre would not be able to exist. Two draws every Wednesday Night during weekly Bingo. 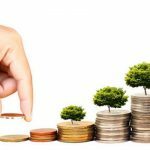 If Weekly Jackpot of €16,000 is not won, we do a second draw. To Enter; purchase a line for €2! Cards available at various establishments in Fermoy and from Fermoy Community Youth Centre. Draw results are printed every Thursday in The Avondhu newspaper and posted on our Facebook Page.